Home » Blog » Coupons » Social Warfare Pro: 4th of July Sale! Social Warfare Pro: 4th of July Sale! 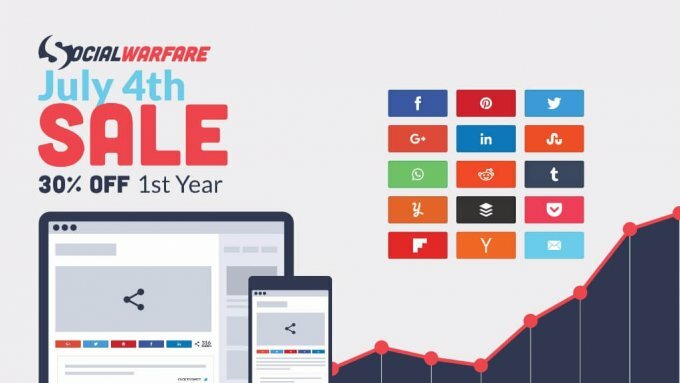 Grab a license to my favorite sharing plugin, Social Warfare Pro, at a 30% discount for one day only: Tuesday, July 4th. No coupon needed, just use this link. The discount applies to both single-site and multi-site licenses, new licenses and upgrades. 2) It integrates seamlessly with a free service that tallies Twitter shares, even now that the official Twitter API only counts the last seven days of shares. 8) It combines the counts for http:// and https:// addresses, which is very important for sites like that have switched from one to the other. 9) And Social Warfare Plus offers conditional use of the Yummly share button only on recipe/food categories. I use this feature on my BarbaraFeldman.com blog. So, set your alarm clock, folks. This is a one-day only sale. I missed the deal and seriously want to buy the Social Warfare plugin. I’ve been using the free version for quite some time now. Waiting for the next deal. Thanks!